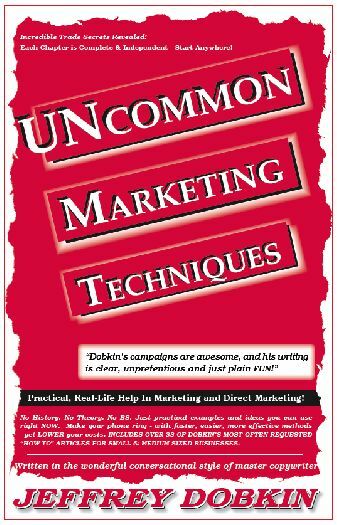 An awesome collection of Jeffrey Dobkin's explicit "How-To" marketing books, and audio interview on Mailing Lists (with Markus Allen). Offered at a special discounted bundle price. An incredible value of successful direct marketing methods. — all for the incredible price of just $39.95. Save over $30!No history, no theory, and no bs — these marketing and direct marketing books and audio are the real deal for marketing anything offline. They're everything you need to know to successfully bring a product to the attention of a national marketplace, in under 6 months and for under $500. You’ll learn about markets - what they are, how to define them, where to find them and how to analyze markets and market segments. You’ll learn about direct marketing, direct mail and how to create winning direct mail packages and responsive direct mail campaigns. Learn magazine advertising from the ground floor up. How to buy magazine ad space at huge discounts, how to find all the magazines that serve the markets you’re interested in. All the tricks of successful magazine advertising, negotiation, testing, ad placement, circulation analysis — written in easy to understand plain English but includes all the technical mumbo jumbo in case you’re interested in that technical side of it, too. Learn in-depth tricks of PR: press releases, getting ink, writing successful press releases and placement. Learn how to create a successful press campaign — again and again. Working with an advertising agency? Here’s how to get an ad or advertising campaign from your agency the first time. See what they’re doing right, and what they’re not doing for you that they should. Learn all about direct marketing and direct mail from reading well over 100 pages just on the specifics of creating successful mailing campaigns. Then, take your mailings to the next levels of success with the one hour audio on the location, specification, and negotiation on buying the right mailing lists. All this for $39.95? Yes. What an incredible offer - almost the complete works of Jeffrey Dobkin - but don’t worry, he’ll write more. Please order now - this offer may be rescinded at any time. Click to order. The best forty bucks you’ll ever spend on learning successful practical, useful marketing techniques - and yes, we’ll guarantee that. This really is an unbelievable package and an incredible value - it would be foolish to pass this up. We have -0- returns to date. It’s a master’s course in successful and practical marketing methods, for just forty dollars. It’s amazing what you'll learn in a few nights of eazy-reading in Dobkin’s own breezy conversational style of writing. Please order now.